Parramatta Bishop Vincent Long OFM Conv. 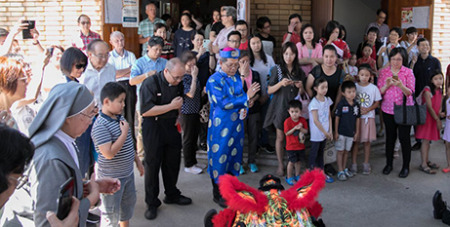 welcomed the Year of the Pig on Sunday with members of the Chinese chaplaincy at St Monica’s Parish, North Parramatta. Source: Catholic Outlook. Bishop Long and Fr Ephraim Lam, parish priest and chaplain to the Chinese community, celebrated Lunar New Year with a Mass that had readings, prayers and songs in both English and Cantonese. During his homily, Bishop Long spoke of the spirit of renewal that comes with the New Year and how the Beatitudes gives us a sense of happiness and “blessedness” in our daily lives. “The Lunar Festival is a summation of ancient wisdom. It is a celebration of what it means to be a human being – a human being in relationship with others, and for us Christians, also a human being in relationship with God who brings all things together in unity,” Bishop Long said. “We affirm these sacred relationships to be fundamental to our existence. Whether we are rich or poor, high or low, there is no true happiness for us without our commitment to attending to and nurturing them. The good fortune wishes and gifts are shallow if our lives and relationships are not aligned with God’s purpose for us and the common good of others. “The Word of God today reinforces the ancient wisdom embedded in our culture. It also calls us to orientate our lives to the higher values and principles that will lead us to true blessedness, not simply good fortune in this world but a fulfilment of our God-given purpose of existence. Bishop Long affirmed that happiness “does not reside in possessions, successes or achievements” but in a “heart open to loving, to giving, to caring, to enhancing the lives of others even to the point of dying for the ones we love”. Following Mass, Bishop Long changed into a blue Chinese silk suit and gifted red envelopes to Mass attendees with Fr Ephraim and altar servers.